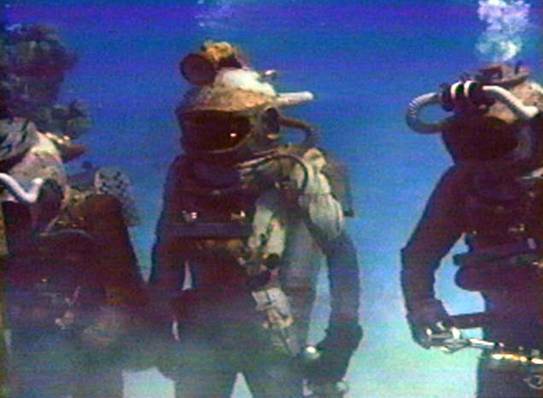 The Disney Stunt Divers played an important role in the filming of 20,000 Leagues Under the Sea but weren't mentioned in the credits. 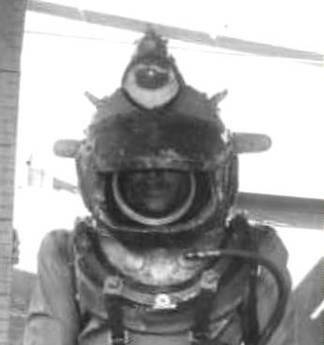 In recreating the 20K diving apparatus, my R&D has always included efforts to identify and acknowledge those men. For decades, Leaguers have wondered who portrayed Captain Nemo in the underwater scenes. Here at VSC I keep several pages for the Disney Divers and have always tried to associate names with faces. Since 2001 I've made many information requests to Corporate Disney and to Leagues-related individuals by phone, letter, and email. I've seen the question raised in Website Discussion Groups where the most avid historians could not identify the man behind that mask. 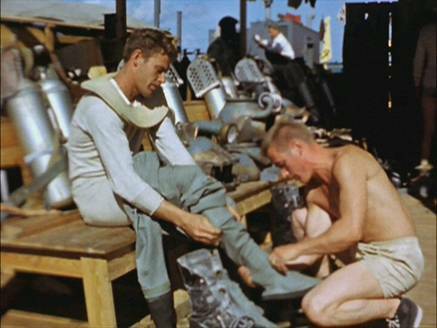 Scene from Disney's Operation Undersea: Captain Nemo suiting up. Over the years I acquired many candid photos and screen grabs; I knew what he looked like but couldn't match that face with a name. Then on Tuesday, October 07, 2014, I found what I was looking for. 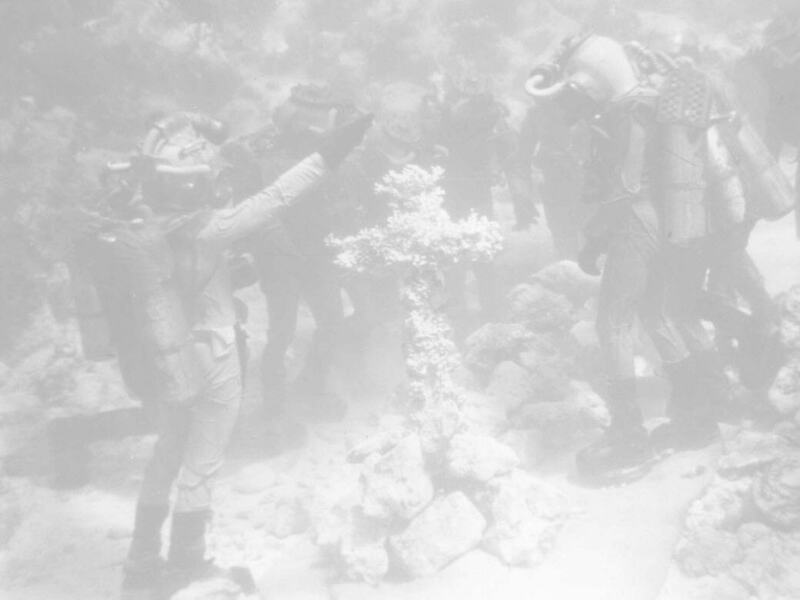 Scene from Disney's Operation Undersea: divers seem amused by hand-signal chart. I was searching the names of known Disney Divers in Google Images. There was one that had always puzzled me: a diver listed only as D. Rochlen. The IMDB listed him as doing stunts for Leagues, but no picture or other information. So, I searched "D. ROCHLEN STUNT" and found old pictures (in an article about Surf Line Hawaii) of a surfer that looked like it could have been him. Reading on, I learned he founded the company back in 1964. Searching the website, I noticed a photo (below) showing a clear view of the gentleman's ear. When I compared that to a screengrab of the Nemo diver taken from Disney's Operation Undersea I knew it was a match; his features were too distinctive and similar for this not be the same guy. Surf Line Hawaii Founder Dave Rochlen examining fabric design patterns. 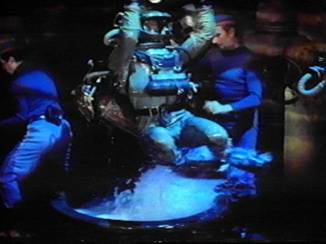 Scene from Disney's Operation Undersea: Stunt Diver checking air supply before donning Nemo helmet. A further search revealed this gentleman had been a California surfer and Santa Monica lifeguard. That rang a bell: Disney Stunt Diver Norm Bishop was a Santa Monica lifeguard, and he helped develop the 20K diving apparatus along with Fred Zendar and Al Hansen who were also from Santa Monica. It all fell into place. I knew I was right. Dave Rochlen was the reel Captain Nemo. Operation Undersea: Santa Monica Lifeguards Dave Rochlen at far left and Norm Bishop in red. As a Hawaii resident, I was familiar with Jams and Surf Line Hawaii, so I sent out some pics and info by email. Before long I was on the phone with Dave Rochlen's son, Pua. I probably rambled on for several minutes explaining pretty much what you've read above before I could no longer contain myself and finally had to ask, "I'm right, aren't I? That's your dad, isn't it?" 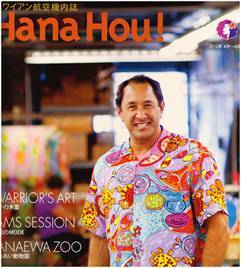 Pua Rochlen on the cover of Hana Hou! magazine. 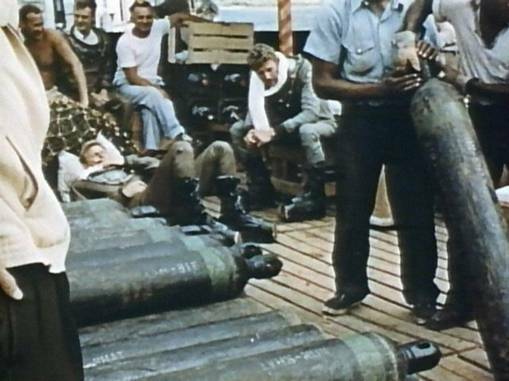 Pua Rochlen confirmed that his father was indeed the man we see wearing gray on the Disney dive barge at Lyford Cay in the Bahamas, from January through February 1954. Operation Undersea: Diver-Tender Len Mott assists Dave Rochlen donning Nemo's gray modified Skooba-Totes drysuit. I listened to Pua recall how his father spoke of being one of the divers in 20,000 Leagues Under the Sea; and, he believed, the one who played Captain Nemo. I provided established facts as best I could. I really enjoyed our discussion and came away with the feeling that it had been a great day for both of us. Pat Regan got the answer to a question that's been bugging him for almost 15 years and solved a long-standing mystery for movie historians. And Pua Rochlen received tangible proof that what he always knew was true; his father was the reel Captain Nemo. 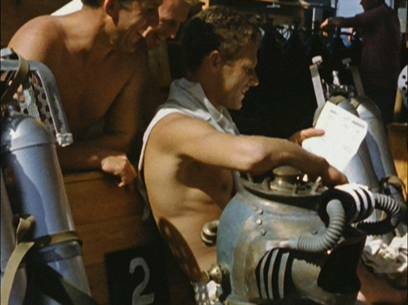 Between dives, Dave Rochlen observes crew servicing air tanks. 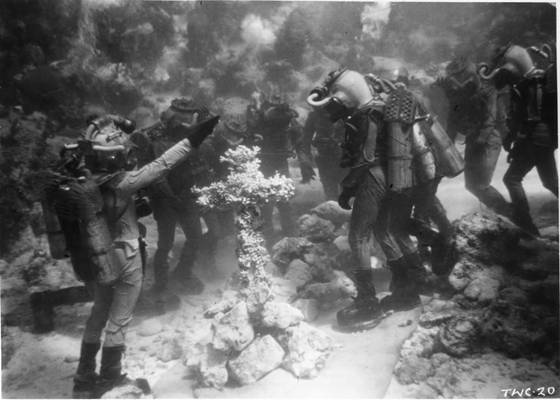 Dave Rochlen leads the famous Underwater Burial scene. 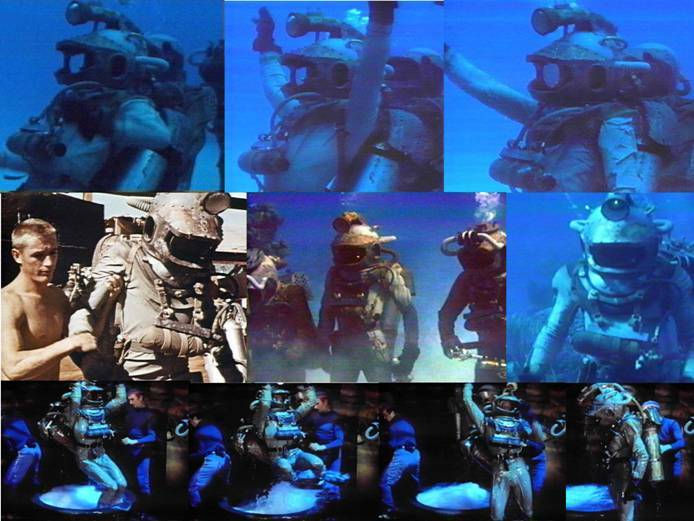 Montage 1: Dave Rochlen as Captain Nemo during the filming of 20,000 Leagues Under the Sea. 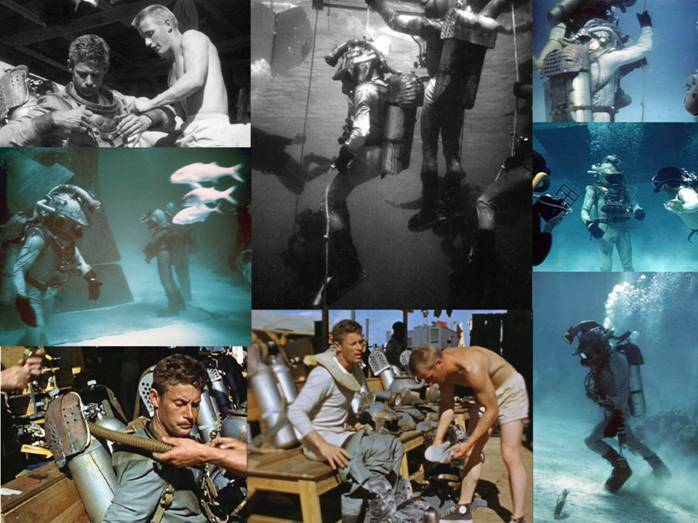 Montage 2: Dave Rochlen as Captain Nemo during the filming of 20,000 Leagues Under the Sea. Born and raised in Santa Monica, California, Dave was a paperboy, print shop assistant, and harvested fruit in his younger years; but his passion was always the sea. "I was going surfing by myself when I was six years old." He was an experienced surfer by age 15 and became a Santa Monica lifeguard. 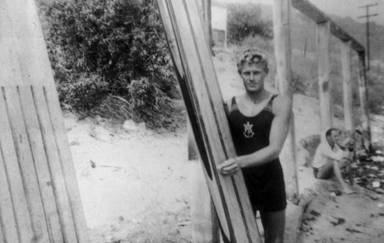 Dave Rochlen in Malibu, 1940. "And when the war ended -- Boom -- we were back in the environment. It was devotion, like seeing a girl again... like, 'I'm never gonna leave!' We gave ourselves over to it entirely. I think it was because we spent four or five years in the war and we had survived. And it had all been bad. Now there was no question about what had us by the throat. It was the ocean. Everything else was secondary." "It's simple," he said when asked by American surf writer Leonard Lueras in 1984 to explain the sport's attraction. "The ocean is the most wondrous thing on the planet, and a breaking wave is the single most exciting thing happening in the ocean. Riding a wave allows you to reach out and touch the face of God." Back in California, Rochlen continued surfing and worked as a Santa Monica Lifeguard with Norm Bishop. So when Goff, Zendar, Hansen, and Bishop made the first prototype Leagues rigs; Dave was already their close associate. And when (as Bill Stropahl calls them) "the Santa Monica guys" phoned E.R. 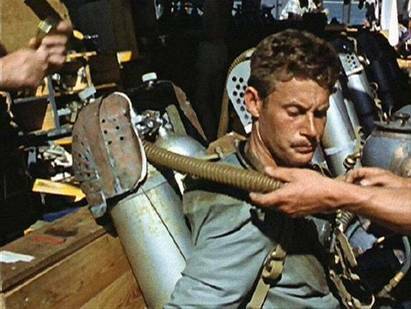 Cross' Sparling School of Deep Sea Diving looking for experienced hardhat divers to work on Walt Disney's 20,000 Leagues Under the Sea, Dave became their lead diver; portraying Captain Nemo in all of the underwater footage shot in the Bahamas and at Disney Studios in California. Dave Rochlen does "trapeze" entrance into the Nautilus' diving chamber. To summarize his education and business career: Dave Rochlen earned a degree in industrial psychology at UCLA and became a Systems Analyst working on missile guidance systems for TRW. 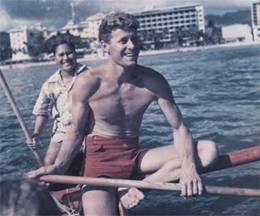 He moved to Hawaii in the early 1960's and, with help of his wife Keanuenue, founded Surf Line Hawaii in 1964 to make and sell his own distinctive style of beach attire. Dave created a novel type of bright, baggy surf shorts and called them "Jams": short for pajamas because they resembled PJ bottoms cut off at the knee. Keanuenue (herself an accomplished Hawaii waterwoman, canoe racer, and daughter of famed ocean lifeguard Aloha Kaeo) sewed up the first pairs by hand. The fashion trend quickly caught on among the surfing community in Hawaii and then California; ultimately spreading from the beach across the country. Dave Rochlen on the cover of LIFE Magazine, 7-4-49. 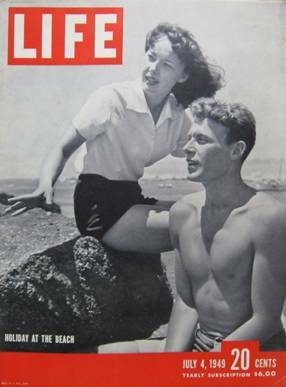 No stranger to the news media, Rochlen was featured three times in LIFE magazine: once on the cover of the July 4, 1949 issue for an article entitled Holiday at the Beach where "LIFE spends a day at the beach with Dave Rochlen, lifeguard"; again in the February 22, 1954 issue as the Captain Nemo Stunt Diver in Peter Stackpole's photo-essay on the underwater filming for 20,000 Leagues Under the Sea; and then again in 1965 as the focus of a photo-essay on Jams and Surf Line Hawaii. 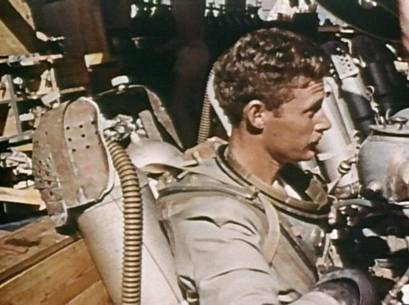 Dave also played a starring role in Disney's 1954 TV program Operation Undersea, where his activities as a stunt diver for 20,000 Leagues were documented in a Disneyland segment which aired one week before the movie's debut in December. 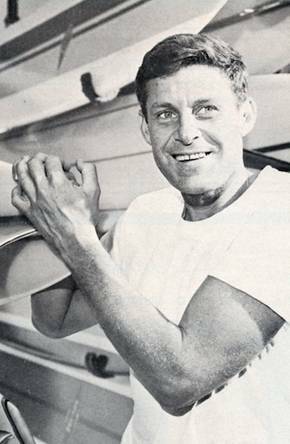 And in 1962, Dave was credited as one of the starring performers in Bruce Brown's surfing documentary, America's Newest Sport. Dave was widely recognized for his business achievements during the course of his career, and received the Ernst & Young Hawaii Entrepreneur of the Year Award in 1998. Sadly, Dave Rochlen passed away in 2003 at the age of 78 due to pancreatic cancer. It's said he literally ran the company until his last day. In 2010 Dave was posthumously inducted into the Surfing Walk of Fame in Huntington Beach for his contribution to beach culture. The feeling I get from studying Dave Rochlen is that he was a man who loved life; a beach boy from birth who loved the sea. He had a serious side, a sense of humor, and there's a bit of the rebel or renegade in there, too. He was his own man. Dave was a doer; a visionary who knew what kind of life he wanted to live and had the courage to follow his dream; a dream that lives on through his family. 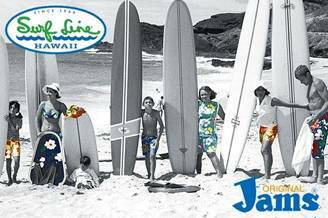 Surf Line Hawaii continues under the name Jams World led by Dave's son, Pua Rochlen. Today, the company is internationally known and loved for their uniquely popular style of surf wear and related products. The link below takes you to the Jams World website. Check it out! Images of Dave Rochlen, Surf Line Hawaii, Jams, Jams World, et al, © Copyright 2015, Pua Rochlen, "All Rights Reserved." Webpage © Copyright 2015, Pat Regan. "All Rights Reserved."